On the 10th May 1940 the German Panzer Divisions abruptly started to move into France via the Low Countries , thus avoiding the Maginot Line that protected the French border with Germany . The British Expeditionary Force was trapped against the sea at Dunkirk . The mass evacuation of 340,000 soldiers (Operation Dynamo) was finished by the 4 th June but most of the weapons and vehicles had to be abandoned, leaving Britain with very little equipment to repel a German invasion. With the German occupation of Norway both the south and east coast of Britain had to be defended. There were less than 1,000 assorted field guns in Britain . Most were survivors from the previous war and needed repair. Once the German Panzer Divisions had landed there was little to stop them advancing quickly inland. As a response to the immediate threat of invasion General Ironside first set up a mobile reserve. He then designated ‘coastal crust’ defences at likely landing places on the south and east coast. These were backed up with an anti-tank line, guarded by pillboxes, to control and slow the advancing enemy until the mobile re-enforcements could be deployed. An anti-tank line started at Newhaven using the rivers Ouse and Medway as natural barriers. The line turned north at Maidstone, via Chatham, across Hoo to the Thames estuary. Continuing via Chelmsford and Cambridge to the Wash. The line was planned to terminate at the Firth-of-Forth. The Germans were expected to use the shortest sea crossing and land between Eastbourne and Dover . The section of the anti-tank line between Newhaven and Hoo was designed to contain and delay this invasion. Another line started at Bristol running to the south of London using the rivers Mole, Eden and Medway as natural barriers. This met the Newhaven – Hoo line at Penshurst. The river Medway runs from west to east through the southern part of Leigh parish. The War Office issued seven standardised pillbox designs in late May 1940. 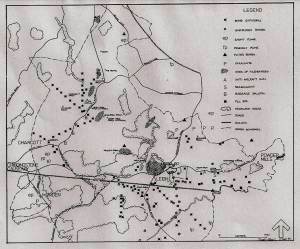 The army surveyed the land on the 25th June and carefully selected sites at intervals along the north bank of the river to respond to attack from the south. The sites were mainly type 24 shellproof hexagonal pillboxes designed for infantry with light machine guns. But a type 28 rectangular gunbox modified to accommodate the WW1 refurbished static Hotchkiss 6-pounder gun guards the point were the railway crosses the Medway. Ensfield Bridge is guarded by a type 28A modified gunbox with an attached infantry chamber. The road running north from the bridge to the railway is defended in depth with pillboxes each side of the road. The railway was to be used as a second stop line. Movable road barriers were placed where a road crossed the railway. Four weeks after evacuation from Dunkirk the 5th Royal Artillery Medium Regiment started installing and manning 47 guns on the Newhaven – Hoo line. However the threat of German invasion was so imminent that an unprotected mounting for a 6-pound gun was placed to cover Ensfield Bridge while the gunbox was hurriedly completed. By August 1940 sufficient work had been done to create a continuous anti-tank line from the Bristol Channel to the Fens . The coastal crust was now considered strong enough to break up a sea bound attack and the RAF retained control of the sky. On 19th August General Brooke replaced General Ironside. General Brooke thought the anti-tank lines would slow the movement of the Mobile Defence Regiments counterattacking a coastal invasion. So all work on the anti-tank lines in the southeast stopped. 24 guns were retained in the Tonbridge Maidstone area but the rest were removed from their mountings and transferred to the forward defences. By late November all 6-pounder guns had been transferred. In two months 1448 assorted pill and gun boxes had been built on the anti-tank lines. Of the 187 built on the Newhaven-Hoo line 140 survive. The 18 surviving pillboxes in Leigh parish are a monument to desperate times.